Backblaze is a company that offers cloud storage space and therefore operates a large amount of storage arrays. As of December 31, 2018, we had 106,919 spinning hard drives. This large amount of spinning disks means that there are also failing drives that stop spinning once every while. 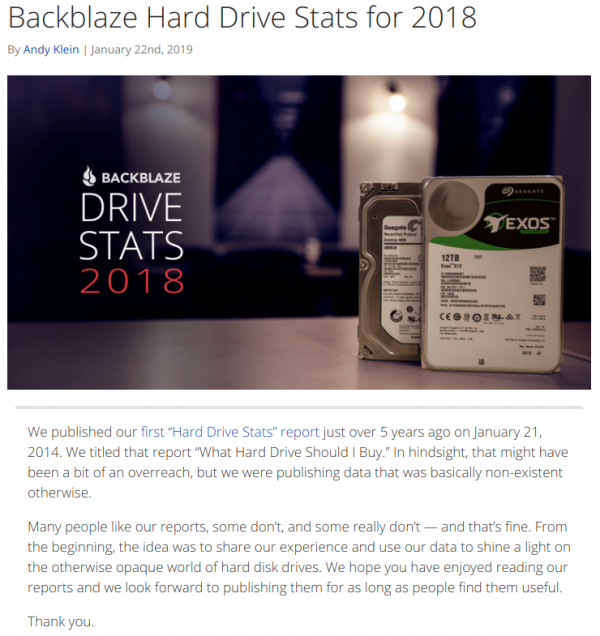 Backblaze saw the need to take note about what hard-drive series fails more of less often and started to generate a yearly report on the reliability of these hard drives. Yesterday they published their report for 2018 – if you got storage requirements or if you are in the market to purchase storage space for your operation – it probably is very helpful to take a look at the report.